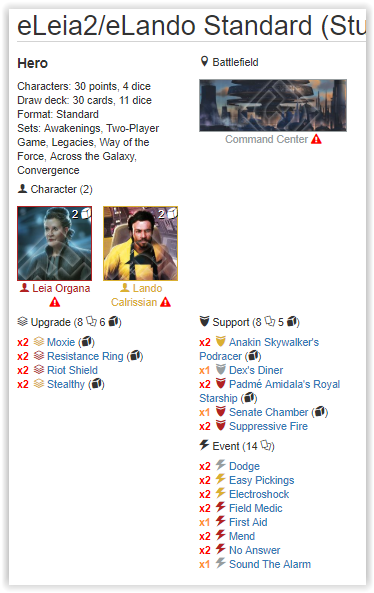 The team at Artificery has compiled a list of some of the more successful decks in the format right now. These are decks you “may” want to test against to succeed at the next competitive event you attend. Due to the prevalence of GQs and people exploring a variety of the formats available in Destiny, I will break these into Standard, Trilogy, and Infinite. Remember, however, this is totally subjective and will largely depend on the decks that are prominent in your local meta. If you want more help to prepare for your competitive events or just work on becoming a better player, you can access our exclusive articles, play-test videos, coaching, meta broadcast, and discord channels by supporting us on Patreon. 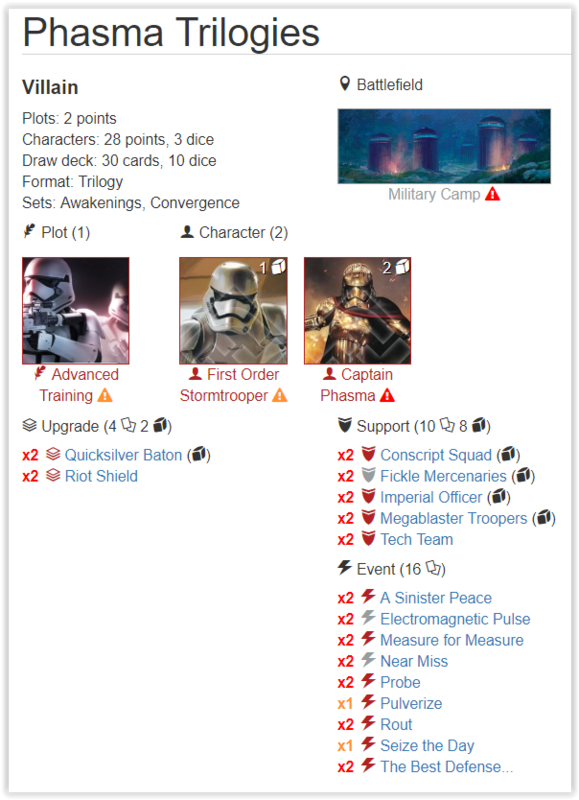 Once again a big shout-out to I Rebel for continuing to update and compile the list of decks placing well at competitive events. The lists will continue to be updated with the most current successful versions of each list. This is the list that George Barnes took to win 6-0 in Standard and apparently his friend took the same list to a 5-1 score the previous day. 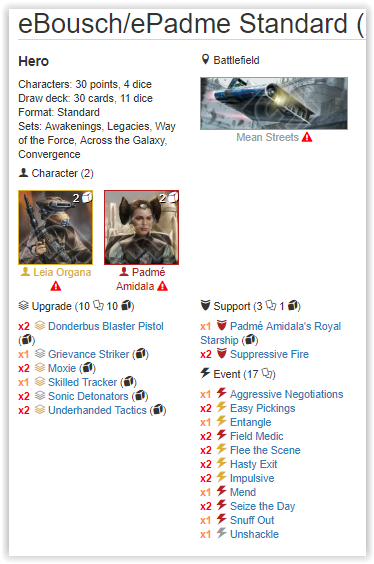 This deck utilizes Padme’s ridiculous focus and attempts to break Bousch’s special with the inclusion of Moxie. Some of these choices are very curious to me (i.e. Donderbus over Grappling Boa), but the success this deck has speaks for itself. 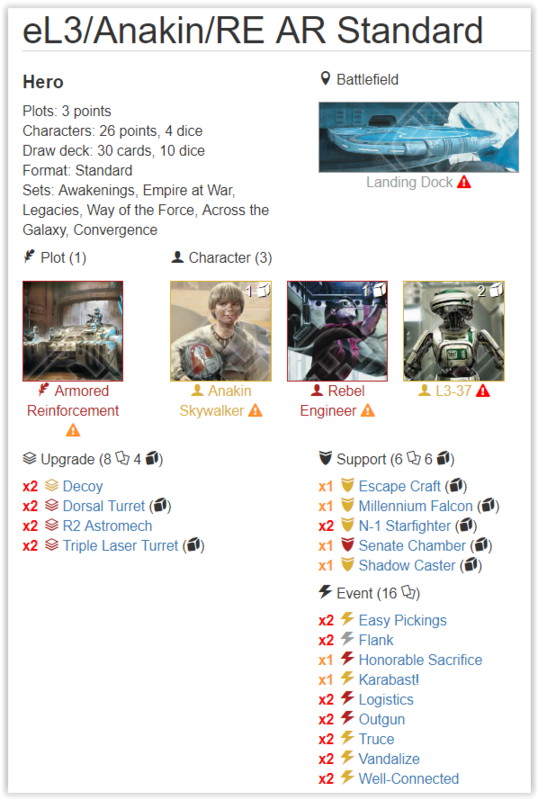 If you want a more detailed write-up I would highly encourage you to visit yourdestiny’s tournament report and Luke Magnuson’s Deck Analysis. I have to admit I was/am very skeptical about this deck’s success going forward. 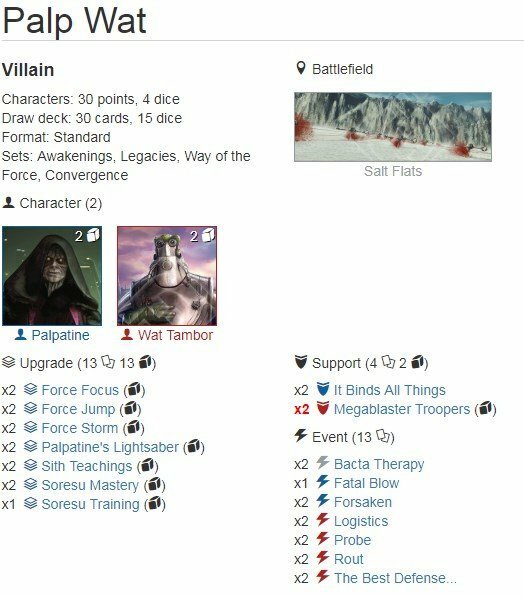 It is not hard to make the comparison to the fall off of eBousch/eYoda after our own FlacidBaron’s regional win in the previous meta. This is the deck that Scott Macdonald took to win his standard event. Was anyone truly surprised to see this deck do well? 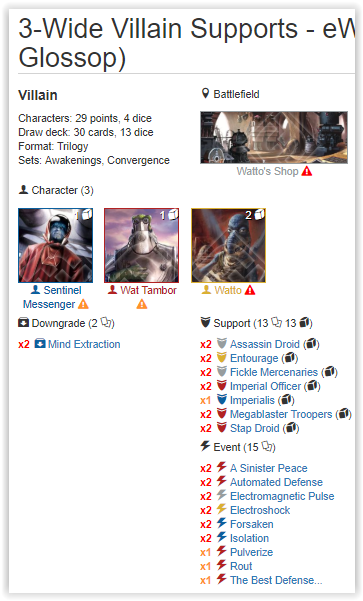 With the inclusion of a protected guaranteed resource in Watto, this deck was bound to make waves as the only downfall to this deck in the previous meta was early control of its resource generating engines. 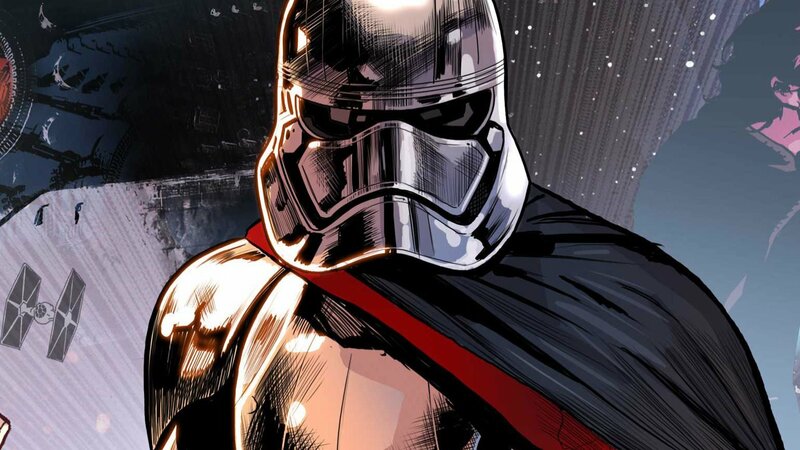 If you thought the supports were nasty before, Snoke now has the Merchants of Death to rely on – Fist, Entourage, and Megablast troopers. Once AoN goes legal, I have a bad feeling that if you aren’t playing an Entourage package you are probably going to lose. Once again if you want a more detailed analysis, I would advise you visit the Your Destiny’s Tournament Report. This is the list Stuart (Sorry could not read your last name on the handwritten slip) took to win his Standard GQ Event. I really like this list and was not surprised to see its success after its dominance in the previous trilogy meta. With the inclusion of Moxie, Resistance Ring, and No Answer this deck received the tools it needed to push to the next level. I would be surprised if I am alone in saying that “No Answer” is one if not the best mill card we have seen in some time. A smart No Answer play can result in a huge swing. Whenever a mill deck is sitting on one resource watch out for pitching to reroll with one card left in hand. Between Moxie and Stealthy, you can look forward to a possible to a likely 8 cards off of the top of your deck. Recycling heal cards or your opponents Routs and/or probes with Resistance Ring? Yes please. Yes, unfortunately, it is still around. And I am sure I am not the only one to notice that this deck might as well be a snapshot from the previous meta. With the inclusion of “Honorable Sacrifice” as the only Convergence card there is nothing new or special about this deck, but it can still snag wins. So if you have a complete dearth of Convergence cards and don’t want to spend any money feel free to run this deck. If it was not apparent enough… yes I absolutely hate this deck. Boring to play as and annoying to play against. This little invention by deck-maestro McBober from our friends at L8 Night Gaming is nasty and I am frankly surprised we have not seen a Phasma deck come to the forefront yet. 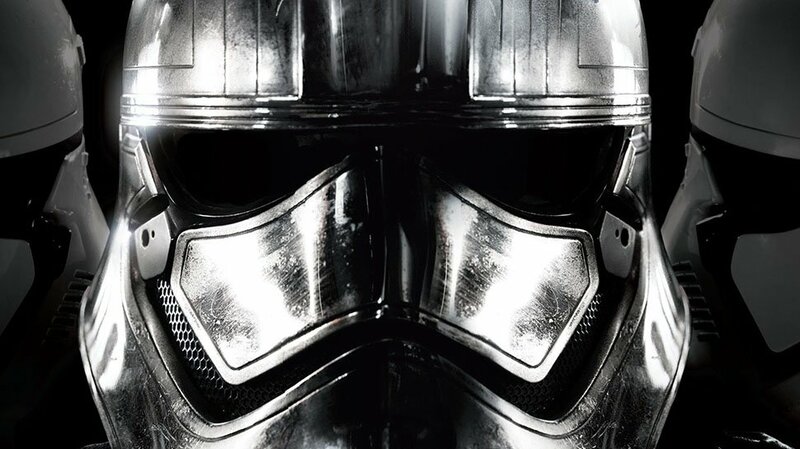 Combining Phasma’s Power Action with Megablaster’s additional First Order Troopers, all these extra dice trigger Retribution. It feels really bad to remove a Trooper 2-R Side only to take a damage in the process. There is so much synergy going on in this deck it is impressive. Almost every support is a trooper, allowing imperial officer to add much needed consistency. Messenger is no slouch either, slow-playing and rolling him to pull choice removal adds a nasty 6-card option. 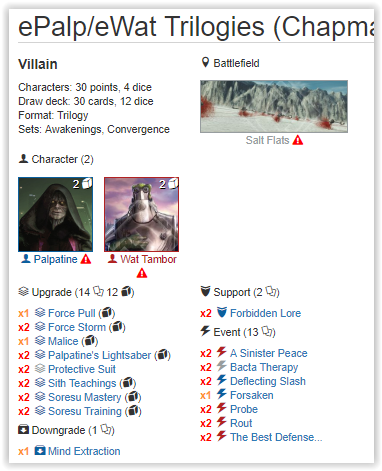 If you want a detailed deck analysis you can access AoZ’s Article by becoming a patreon. So there are a lot of ways to build Palp, but all of them share one thing. Upgrades. 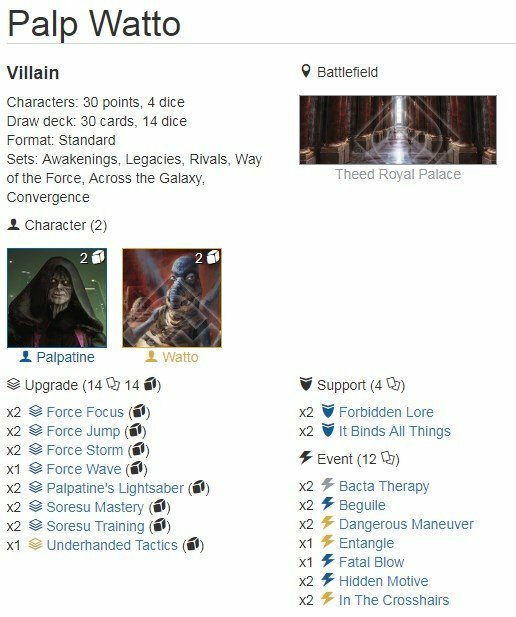 These games will come down to whether Palp ramps fast or gets blown up before he efficiently ramp. The more aggressive you are against Palp the better. If you want an insanely indepth analysis on all things Palp check out AoZ’s One Stop Palpatine Shop Article. I have to say I was actually super excited to build decks in the new trilogies with only one set. Nostalgia for Awakenings when the game first came out. With that said, building decks with Convergence is nothing like Awakenings, because the tools now are so much more powerful then what we used to have access to. With that said, I will list the decks that have had success and other decks I think we will see. I absolutely love this deck concept and my local deck-maestro Matt Whitney created something similar with eJabba/Wat/Messenger. However, this deck is insanely heavy on the supports whereas Matt focused on a bigger event suite. With Watto’s money-making capabilities and having access to the full array of Convergence cards, this deck capitalizes on all the new fun toys Converge has provided (i.e. Entourage, MegaBlast, and Forsaken). Wat’s ability really shines in this build as your supports are rolling in twice a round. This deck can struggle with ePhasma/FOST AT due to its early round aggressiveness, but if you let this deck hang in too long you are in trouble. So the question being why not Watto? It’s easy, because Wat offers way more in Trilogy. 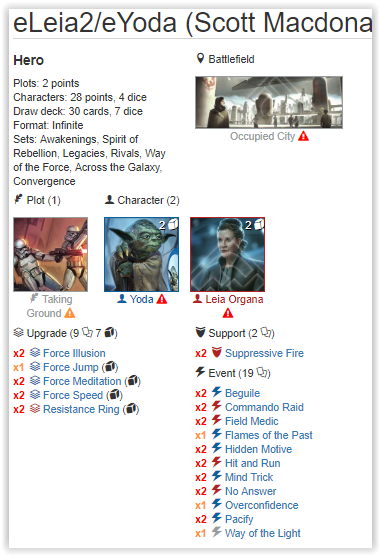 Giving you access to key cards like Probe, Rout, TBD, and a Sinister Peace gives Palp the key event cards he needs to prevent dice control and to effectively control the massive amount of dice some of these other decks can put out. I am not even going to try to list all the other possible successful trilogy decks. 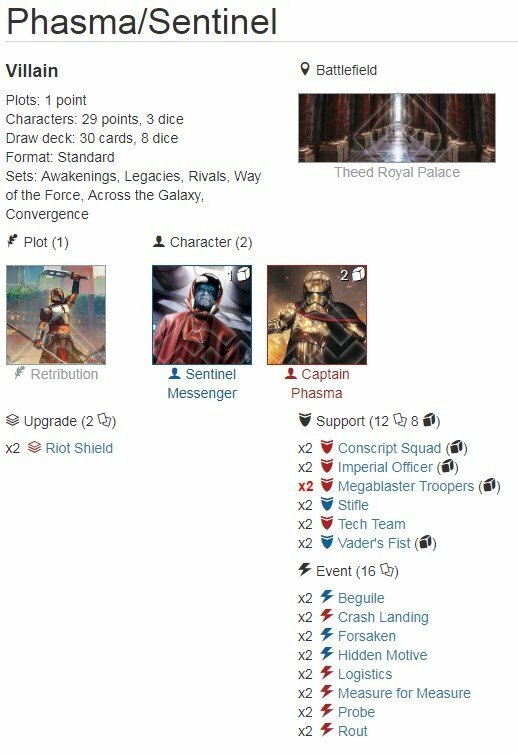 I have seen some effective ePadme/eKes, eMace/eK2SO, and Grevious/Messenger/Double Droid decks, but will these decks have what it takes to take out the top contenders? We will have to see. I will add one other deck worth testing against and I will not be surprised if it wins some trilogy events in the near future. Honestly if you are going to test a trilogies deck you need to make sure you can beat this. It is so damn consistent and really just needs an early imperial officer to absolutely wreck your day. This deck hits and hits hard, and the sneaky pulverize play can end a game. Yep that’s right eLeia2/eYoda. We saw how successful this deck was in the previous Meta with multiple Regional wins by our own AoZ and Hyperloops’ Reflex. With some key additions from Convergence with Resistance Ring and No Answer this deck has the answers it needs to survive and mill you even faster. Have fun playing this deck everyone. Please let us know if you think we missed any decks. 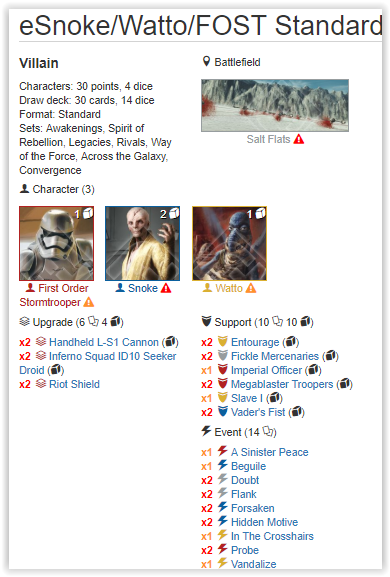 The meta is extremely broad right now with many different variations of all of the above decks. We hope this helps you prepare for your upcoming Regional(s). The material that we provide to the public is just the tip of the iceberg when it comes to in-depth analysis, commentary, play-test videos, and coaching that is available to our Acolyte-tier patreons (i.e. $10 a month). Artificery also frequently gives out alternative art cards and hosts numerous tournaments to help people prepare in a competitive format. Becoming a patreon will also give you access to events throughout the country that are hosted for our acolytes at the major Star Wars Destiny events. If you are looking for a fun, mature, and competitive group this is the right place for you. 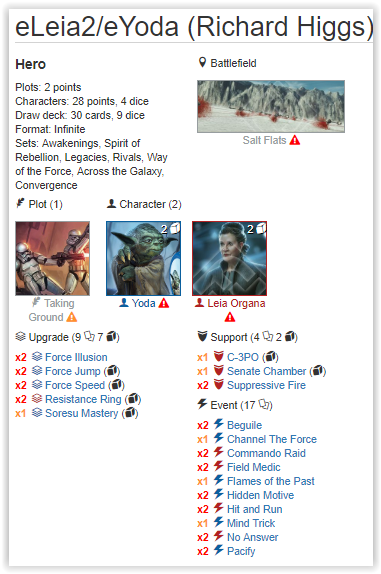 The Artificery Crew is a top performing Star Wars Destiny team, that prides itself for its welcoming community, tier 1 strategy articles, fun podcasts, and engaging video content. If this sounds good to you, head on over to our Patreon to get immediate access to everything as we produce it and priority access to the Crew for playtesting, upcoming tournament strategies, meta discussion. The Crew also hosts one of the largest free access Discord servers for the Star Wars: Destiny community full of lively chat and the best rules discussion channel available. Become our Patron to see this content! Learn more at our Patreon page. Hexen, Shuffman and XeroHour analyze the latest spoilers, sifting the good from the bad and useful from unplayable.